In most cases, we will use clustered and non-clustered indexes to help a query go faster, but these kinds of indexes have their own limitations and cannot be used for fast text lookup. For instance, a LIKE operator will lead SQL Server to scan the whole table in order to pick up values that meet the expression next to this operator. This means it won’t be fast in every case, even if an index is created for considered column. The building and usage of Full-Text indexes is always performed in a specific language context like English or French. Now that we know what the purpose of Full-Text Search feature is, let’s invest some time in the understanding of how it works. This will help us manage this feature. Notice that, already at SQL Server installation, we can tell that this feature is special as the installer defines a daemon service called “fdhost.exe”. This process will be referred in following as the “filter daemon host“. It is started by a service launcher called MSSQLFDLauncher for security concerns. It will exchange data with SQL Server service (sqlservr.exe) via shared memory or a named pipe. Fdhost.exe process will access, filter and tokenize user data in order to actually build Full-Text indexes. It’s also called to analyze Full-Text queries, including word breaking and stemming (see below for more info). User tables – (sqlserv.exe) – tables for which a full-text index exists. Full-Text gatherer – in sqlserv.exe – a thread responsible for scheduling and driving index population so as for monitoring. Thesaurus files – (sqlserv.exe)– files that contain synonyms of search terms. Query Processor thread – (sqlserv.exe)– thread that compiles and executes T-SQL queries and send Full-Text search to the Full-Text Engine twice: once at compilation and once during query execution. The query results is matched against the full-text index. Full-Text Engine – (sqlserv.exe)– can be seen as part of the Query Processor. It compiles and runs full-text queries and takes stoplists and thesaurus files into account before sending back results sets for these queries. Full-Text Indexer – (sqlserv.exe)– This thread builds the structure used to store index tokens. Filter Daemon Manager – (sqlserv.exe)– this thread monitors the status of the fdhost.exe daemon service. Protocol Handler Thread – (fdhost.exe) – this thread pulls data from memory for further processing and accesses data from a user table. Word breakers and stemmers (fdhost.exe) – Each language has its set of word breakers. These components help to find the boundaries of each word in a sentence based on lexical rules of its associated language. So they help tokenizing sentences. Moreover, each word breaker is used in pair with a stemmer component. This component helps to find the root of a verb (its inflectional form) and conjugates verb, also based on language-specific rules. For instance, it will consider all these forms as being the same: “writing”, “wrote”, “writer” are all forms of the word “write”. Words identified by either of these components are inserted as keywords into a full-text index. First of all, we have to know that any full-text index is stored into what Microsoft calls a “ full-text catalog”. It’s like a container for Full-Text indexes. Why did Microsoft define a logical container for Full-Text indexes? Simply because these indexes are usually split across multiple internal tables that are called full-text index fragments. These fragments are created as we insert or update records. In that results set, we can see that for document with identifier “14536”, there are 3 occurrences of “%)” keyword. We can define only one Full-Text index per table while we can define multiple ones for normal indexes. Adding data to a Full-Text index is referred to as population. In contrast to normal indexes, these populations are not part of a transaction. This means that even though the data has been inserted in a Full-Text indexed table, which happens once the transaction that inserts these data is committed, this does not necessarily mean that the Full-Text index has been updated. Full-Text index population is asynchronous. There is no grouping of normal indexes into an index catalog. OFF: means that SQL Server won’t track data changes and maintenance of this index is performed totally manually. On systems using this feature extensively, this mode could eventually require large maintenance windows as population would have to check read all the table. You will find below a diagram that summarizes the way a Full-Text Index has to be populated (for the first time or based on user activity) with only one new or updated record. There is one important thing to notice: index population is initiated by sqlserv.exe and the population is actually performed by fdhost.exe. As discussed above, this population won’t happen every time a user created or changed a record in a Full-Text indexed table. Instead, when change tracking is in AUTO mode, it’s the Full-Text Gatherer thread (inside sqlserv.exe) that will tell fdhost.exe to start index population. This is part of the explanation why index population process is not synchronous with data modifications. Let’s say we have a table called MyDocs with two columns, one called DocId that uniquely identifies a record and one called Comments that contains a comment on the document in plain text, so it’s a VARCHAR column. Now, let’s say that we already created a Full-Text Index on that table and SQL Server decided that it’s time to populate it. It will do the same with the second document so that the keywords list will be composed of: “cool” , “indexes”, “resources” and “tables”. It will then analyze the Comments column for the third document and build following keywords list: “cool”, “Full-Text”, “Full”, “Text” and “workshop”. The list above would be the actual data stored in our Full-Text index as the table was empty. You can check that this is actually what you get by running the code in the Appendix A of this article. But, it’s recommended to read all this article before going straight to this appendix! Let’s say we have a table called [dbo]. [DM_OBJECT_FILE] already created using following statement. Each file imported into that table is uniquely identified by FILE_ID column, FILE_TXT column refers to the contents of this file and OBJ_FILE_IDX_DOCTYPE refers to the kind of document that is stored in the FILE_TXT column. If it appears that Full-Text is not installed, you should consider to install it first. What is the key index to be used in order to uniquely identify records? Which language is used in this column or is it preferable to be totally neutral regarding language interpretation? Do we enable change tracking and let the index update by itself or do we manage this part ourselves? You will find below the create statement for a Full-Text Index on FILE_TXT column from table dbo.DM_OBJECT_FILE, with neutral language interpretation, automatic update and no stop list. Enable or disable change tracking for Full-Text Index population. If it stays enabled, we can tell SQL Server whether to automatically schedule an index population based on user activity or to let us do it manually. Add, modify or edit the list of columns that should be part of the Full-Text Index. For further details, please refer to Microsoft’s documentation page. Once everything is in place, our Full-Text Index is created on our table and we can start using it with built-in functions. Following functions are predicate functions. This means that it returns a Boolean value that can be used in a WHERE clause. Searches for precise or fuzzy (less precise) matches to single words and phrases, words within a certain distance of one another, or weighted matches in SQL Server. Searches for values that match the meaning and not just the exact wording of the words in the search condition. tokenize its lookup text in the same way a Full-Text index is populated (using word breaking and stemming, removing stop words). Each token is assigned a weight. then it will generate a list of expansions and replacement keywords based on the thesaurus. Finally, it will compare the list of keywords in the Full-Text index and those that it listed in order to generate a Boolean value that will be returned. RANK: the RANK column is a value (from 0 through 1000) for each row indicating how well a row matched the selection criteria. Returns a table of zero, one, or more rows for those columns containing character-based data types for values that match the meaning, but not the exact wording, of the text in the specified column. Here is a comparison in terms of the number of results between CONTAINSTABLE and FREETEXTTABLE predicates using the example usage above. As we can see, for the first one, we get back only 13 rows and ranking value is not that high while the second returns 17 rows more and ranking values are higher. Furthermore, we can check that the ordering of keys is different: The key 16575 is at the fourth position in the first screen capture while it’s at the second position in the second one. These predicate functions can be used extensively and are not limited to fixed lookups. Instead, there is extensive grammar functionality associated to its lookup parameter. On each documentation page for these functions, we will find the definition of a <contains_search_condition> in the function’s grammatical definition. If we look closely at this grammar, we can see that it’s very rich and we have to learn this in order to get the most power out of Full-Text Search feature! There are two ways to check how Full-Text feature parses a given text depending on the source of the text. If you want to check fast what keywords you would get for a particular string, you might want to use sys.dm_fts_parser built-in function. Here is an example of call to that function. The first parameter is the string that has to be parsed. The second parameter is the language identifier. Here, it’s set to 0, which means it’s neutral. The hhird parameter is the identifier of the stoplist. Here no stoplist is used. The last parameter tells this function whether to be sensitive or not to accents. Here, we asked for insensitivity. In other words, this function will take the information you would provide when creating a Full-Text Index. It returns a dataset with a hexadecimal representation of the keyword, its corresponding form in the plain text, the identifier of the column in which the keyword has been found and finally the number of documents where this keyword can be found. You will find below a T-SQL query to get back keywords found by Full-Text feature in our dbo.DM_OBJECT_FILE table so as its results set. If you are DBA, you can’t neglect the question of maintenance for these particular indexes that are Full-Text indexes. Except for large systems, I think there is no reason to set change tracking to another mode than AUTO. That’s the reason why we will just cover this mode. Actually, it’s difficult to get good recommendations about the way we should do this. For example, I haven’t found a rule from Microsoft that says “if there is 10% fragmentation then reorganize, if it’s more than 30% then rebuild the index”, which is the common guideline for normal index maintenance. 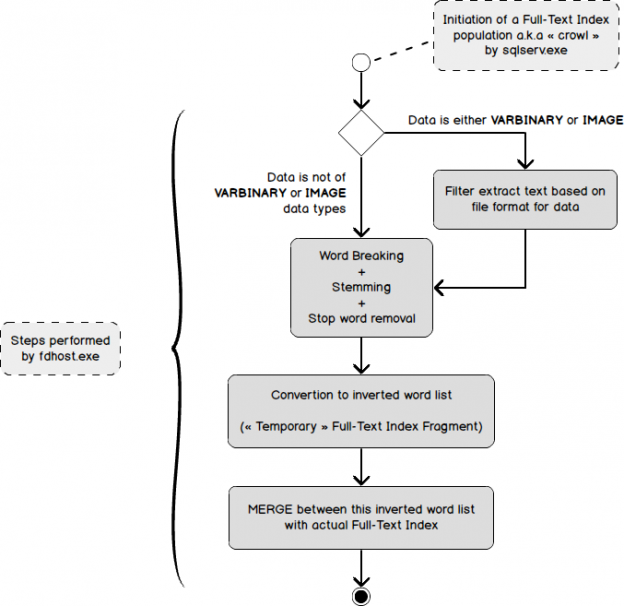 How do we rebuild a full-text index? Can a Full-Text index be fragmented? If so, how could we get some details on this? Once we have details on this, how to determine when it’s necessary to take corrective actions? How to reorganize or rebuild a particular Full-Text index? There is no capability to reorganize or rebuild a given Full-Text index except by dropping and recreating it, using DROP FULLTEXT INDEX and CREATE FULLTEXT INDEX commands. However, let’s remember that these indexes are grouped into a logical container called a Full-Text catalog. While we can’t rebuild or reorganize a particular index, we can do it on a Full-Text catalog using ALTER FULLTEXT CATALOG T-SQL command. The answer to this question is pretty obvious as we said that, by design, the Full-Text index is built using index fragments created during index population (or index crawl). This means that, yes, Full-Text indexes can suffer fragmentation and a high fragmentation will obviously have a direct impact on application performances. How to check for Full-Text index fragmentation? Which indexes are in which Full-Text Catalog? How much space is consumed by a Full-Text Index? On which object a Full-Text Index in based? When do we need to take corrective actions? Based on the researches of Geoff Patterson, he defined that a Full-Text Index needs to be rebuilt starting at 10% of fragmentation. In his blog post, Barry Kind suggests to reorganize the Full-Text catalog when 30 to 50 fragments per table are reached. There are some tests that have to be done in order to find the right set of criteria but they won’t be covered by this article. You will find below the T-SQL instructions that will allow you to check the results we announced in section Full-Text Index population by example.